I’m sure this caught many of your eyes. This is the new, impressively vibrant A4 Heat Press. This compact, robust unit has a plate of A4 size (300 x 210mm) and is simple to use whilst being extremely portable, weighing just 14kg. The gas spring assisted platen provides high, even pressure, making this press ideal for LIT, Sublimation and the use of all of TechSoft’s heat applied media. Precise time and temperature controls are easily set and monitored using the LCD display and simple interface. 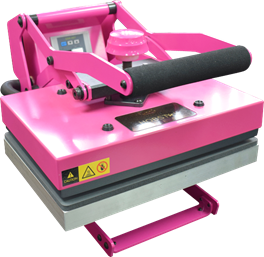 Playful in appearance; easily moved around and repositioned due to its weight and size; simple to use thanks to its LCD display and assured reliability - this really is a heat press to be reckoned with. The Heat Press is priced very competitively and includes two PTFE sheets for your heat application needs. We feel all these qualities make it the ideal gateway model to help your department get a foot-hold in the image transfer sector without the commitments involved in the larger presses. For more please visit our heat presses page.